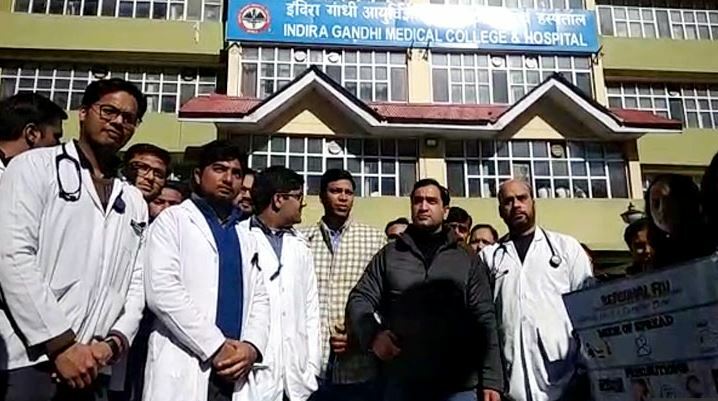 Doctors of Resident Doctors Association on Monday observed two hours "pen-down strike" outside the Indira Gandhi Medical College and Hospital in Shimla while protesting against the bank guarantee policy. Shimla: Doctors of Resident Doctors Association on Monday observed two hours "pen-down strike" outside the Indira Gandhi Medical College and Hospital in Shimla while protesting against the bank guarantee policy. In an efforts to prevent doctors from joining private hospitals, the Himachal Pradesh government has made it mandatory for the MBBS doctors, who wanted to pursue higher courses like MD/MS, to submit a bank guarantee of Rs 10 lakh until now. Recently, the government has reduced the bank guarantee to Rs 5 lakh. Over 100 doctors are demanding the complete removal of bank guarantee bond condition laid by the health department of the state. In addition to that, the doctors are also demanding to increase their stipend from Rs 35,000 to Rs 50,000.